As we approach the New Year, this is a fitting time to reflect on the last 12 months, and look forward to the challenges and opportunities we face in the coming year ahead. While Brexit has taken up much of government’s time, no one can seriously question the exhaustive efforts of those – from the Prime Minister down – who have been engaged in this process. That’s why it’s so frustrating that much of that effort has been misplaced, not least because essential parts of the legally-binding Withdrawal Agreement and non-binding Political Declaration are wholly unacceptable. For the UK to pay £39bn to continue to be subject to great swathes of EU law without being able to influence them and without any binding promises of a trade deal is ridiculous. Canada paid nothing to the EU for its CETA deal and nor should we. We’re the fifth largest economy and should not be afraid of being like most of the rest of the world working on World Trade Organisation rules. ‘Despite Brexit’, as the adage goes, the government has much good news to tell: unemployment at a record low; real wage growth the highest in a decade; and 1.9m more children now in good or outstanding schools. Great achievements that are improving the lives of families in Thanet and across our country. The economy is in a good place. Locally, I’m calling upon the NHS in Kent and Medway to look again at the proposal to improve stroke services in the county given that it’s a practical impossibility for Thanet residents to travel to the William Harvey Hospital in Ashford within an hour. The only satisfactory outcome is a 4 centre option which upgrades QEQM to include a hyper acute stroke unit for Thanet. Dental provision in areas of the constituency remains a pressing issue for many. While the temporary reprieve I secured for New Street Dental Practice in Sandwich is welcome, my fight to reverse the lack of NHS dentistry locally continues. Like so many areas around the country, Thanet has suffered the loss of a number of bank premises in recent years so I was pleased to be able to officially open two Post Offices, one at Newington, the other in Broadstairs High Street. These new services have been warmly welcomed by residents. Looking ahead, my main short-to-medium term aims for Ramsgate are to ensure that the town receives its fair share of government regeneration funding, combined with private, heritage-led regeneration. I am working hard to find a long term solution to Ramsgate Port that will create jobs, investment and tourism. Broadstairs is also a special place at the heart of the Thanet Riviera, and I intend to do all that I can to ensure that it remains so. Indeed, my constituency office and most Surgery appointments with constituents are held in Broadstairs. I have also seen a lot of private investment-led improvements in Cliftonville over the years, and I intend to focus on keeping those improvements rolling in, just as publicly-funded regeneration in Margate has delivered such a positive impact on the whole area. So there’s lots to do. Do enjoy what’s left of 2018 and I’ll see you in 2019 for what will be a significant year. Over the last few weeks, lots of primary school children in South Thanet have been busy drawing Christmas puddings, Christmas trees, snowmen, angels, reindeers, sleighs, stars, robins, bells and all-things-Christmassy for Craig Mackinlay MP’s annual Christmas Card Competition. Back in the Autumn, Craig asked all primary schools in his constituency to invite their pupils to design the Christmas cards that he will be sending family, friends and other MPs. Craig, ably assisted by the constituency staff in his Broadstairs’ Office, agreed which of the children’s designs should be featured on the card. The winner of the competition was Valerie from Bromstone Primary School in Broadstairs. The runners up were Abigayle from Dame Janet Primary Academy; Iris from Christ Church CoE Junior School; Sonny from St Joseph’s Roman Catholic Primary School, Malgorzata from Dame Janet Primary Academy; and Ruby from Newington Community Primary School. “I am very grateful to all the children in South Thanet who entered my 2018 Christmas card competition. “This year, as in previous years, I received so many fantastic designs from primary schools around my constituency. “The competition is always enjoyable, although, given the depth of artistic talent in South Thanet, choosing a winner is never easy. 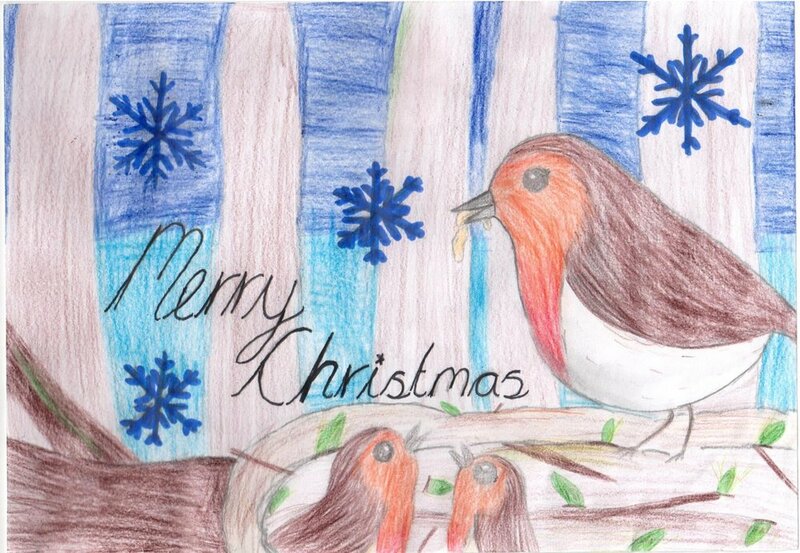 “After some thought and consideration, I chose Valerie’s beautiful drawing of three robins. I was also greatly impressed by Abigayle and Malgorzata’s Christmas trees, Iris’ penguins, Ruby’s reindeers and Sonny’s snowman so I have chosen these as my runners-up. All 2018 entrants can be viewed on Craig’s website. Craig joined Broadstairs & St Peter’s Town Council Mayor and dedicated hospital staff for the occasion. Craig Mackinlay MP has made a festive trip to the Christmas Party of the children who have been through QEQM’s Rainbow Ward over the last year. The party was held at St George’s Church of England School, Westwood Road in Broadstairs. South Thanet’s MP brought with him a box of toys courtesy of the British Toy & Hobby Association (BTHA) in support of their ‘Don’t toy with children’s safety’ campaign. The campaign celebrates the essential contribution of quality toys to a child’s development, and the importance of protecting children from unsafe, counterfeit and copycat toys on the black market. Mince pies, orange juice and sweets were enjoyed by the children, QEQM staff and the MP. “I was pleased to thank the brave children of Rainbow Ward for inviting me to their Christmas Party by presenting them with a box of toys kindly donated by the British Toy & Hobby Association. South Thanet’s Member of Parliament, Craig Mackinlay MP, has made a festive visit to residents at the Royal British Legion’s Maurice House in Broadstairs. Like every one of the Legion's care homes, Maurice House is exclusive to ex-Service people and their dependents. Craig makes an annual trip to the residents of Maurice House at the end of each year to thank the veterans for their service to our country and to wish them well as the festive season approaches. “The whole country values greatly the contribution made by our Armed Forces personnel and their families, and the many sacrifices made through their service in keeping Britain safe. “That ‘s why, each Christmas, I like to visit some of our local veterans at the Royal British Legion’s Maurice House in Broadstairs. “Maurice House provides a fantastic, welcoming home for those who have given so much, such as new resident Wally Smith, veteran of Operation Market Garden and holder of the Légion d'Honneur. “As well as wishing the ex-Service personnel all the best for the festive season, it gives me an opportunity to gauge their views on current affairs both nationally and locally. 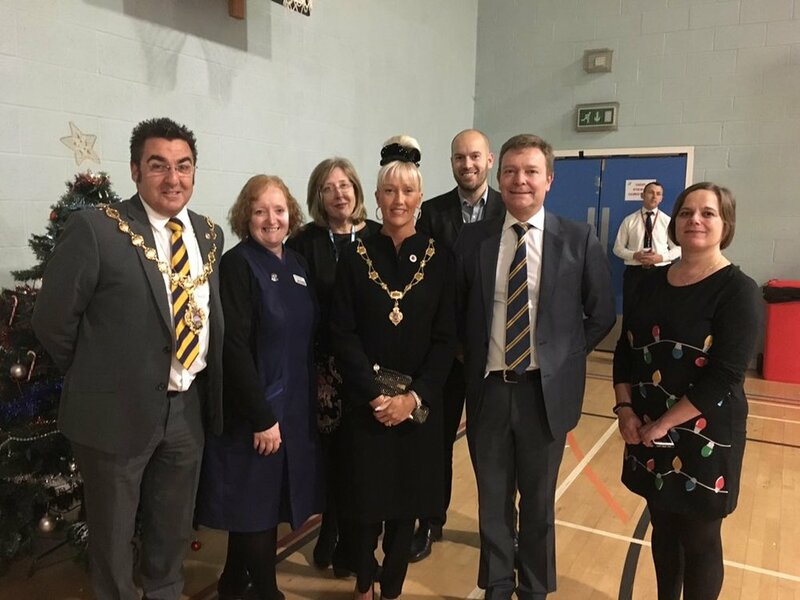 Craig Mackinlay MP, South Thanet’s Member of Parliament, attended Thanet Male Voice Choir’s Christmas Concert on Sunday, 9 December. Upton Junior School Choir and Proteus Brass Ensemble also performed at the concert, which took place at Holy Trinity Church Broadstairs and raised funds for charity. This year’s charity – SERV (also known as Kent Bloodrunners) provide essential volunteer high speed transport of blood supplies around the county. 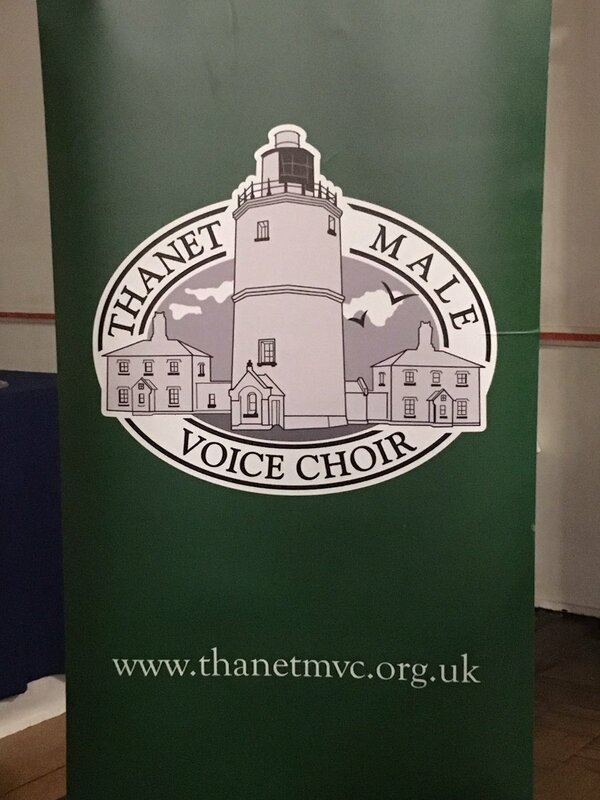 “I am grateful to the Thanet Male Voice Choir’s for inviting me to this year’s Christmas Concert. “The choir, along with Upton Junior School Choir and Proteus Brass Ensemble, worked very hard to prepare their repertoire in the weeks leading up to the event and beautifully sang a variety of our favourite Christmas carols. My regular column generally attempts to cover two things: to reflect on events, usually political, with a report on local community activities that have caught my attention and to give my interpretation of what lies just around the corner. An attempt to give you, from the heart of Westminster, news before it happens. As I write this piece on Monday morning, that rule does not hold true for the potentially turbulent week ahead. And so it is probably best for you to write the news, to delete as appropriate once we reach the end of the week as you read this. I am of course, trying to give some foresight into how the week will unfold on Brexit votes in Parliament. So, for you to amend: the Parliamentary vote on the Withdrawal Agreement and Political Declaration was passed/went down by close to 200 votes/was amended and passed/amended and still fell by just under 100 votes/an opposition amendment was passed and the outcome was that the PM went to Brussels to try to amend the backstop/faced a vote of no confidence in the government proposed by the opposition which led to xxxxxxx. You write the rest as the variety of outcomes are as complex as a game of chess, or more labyrinthine than a storyline of the TV series “House of Cards”. At least I tried. Small Business Saturday has become an important annual event in the national calendar. I’m not sure if it is an Americanism that has crept in, being held on the Saturday after the ‘Black Friday’ sales. It serves to support and celebrate the local businesses, usually owned by local people that form the backbone of our economy with turnover, employment and profits staying local. I was pleased to have the Rt. Hon Mel Stride MP, the Financial Secretary to the Treasury with us for a business forum at the Pavilion by the Sea, Broadstairs. As the Minister responsible for HM Revenue and Customs, and the Minister who presents the Finance Bill following the Budget, he was on hand to discuss all things tax and to hear many great ideas from the business audience, particularly on VAT registration thresholds. This being my last column before Christmas, time to look forward to the festive season, which for many is in full swing. I have written some of my cards, am yet to buy any presents, and am yet to put up any decorations. Thankfully that is not true of many boat and business owners in and around Ramsgate Royal Harbour. We have once more a fantastic display which is pulling in the crowds from far and wide. Well done all; this annual effort is truly fantastic and improves every year. For me, I know that the festive season has truly begun following the annual Thanet Male Voice Choir Christmas concert at Holy Trinity Church, Broadstairs supported by the children from Upton Junior School. This year’s charity – SERV (also known as Kent Bloodrunners) provide essential volunteer high speed transport of blood supplies around the county. A great choice. Sir Roger Gale MP & Craig Mackinlay MP at a Thanet Export Event, July 2018. New figures show that the United Kingdom exported £335.587 billion worth of goods and services in the year to September 2018. This is an increase of 4 per cent from the year before - some £12.8 billion. South Thanet MP, Craig Mackinlay, has hailed the latest figures, which show that businesses across all corners of the country are exporting across the world. The figures are the latest confirmation that the UK continues its success as a great exporting nation – with exports in goods and services helping to create more, better-paying jobs across the country. “These figures show that Global Britain is open for business, with our goods and services in high demand across the world. “It’s great to see that our exports totalled over £335 billion over a 12 month period. “And, with our Export Strategy, we can support more companies to export so that they can grow, are more productive and can create more, better-paid jobs. Local MP, Craig Mackinlay, has welcomed a £6.5 million investment for the Kent and Medway EDGE Hub, a teaching and research centre with satellite facilities at the Discovery Park in Sandwich in his South Thanet constituency, as well as Canterbury Christ Church’s Medway Campus and other parts of Kent. The Modern Industrial Strategy, through the biggest transformation to technical education in a generation, ensures that people can boost their skills to take on the challenges and jobs of the future. Last year, there were 31,080 apprenticeship starts in the South East of England, giving more young people to develop their skills while contributing to a business. “I’m delighted that, as part of our Modern Industrial Strategy, my South Thanet constituency will benefit from a £6.5 million investment for the Kent and Medway EDGE Hub, which has a facility at the Discovery Park in Sandwich. Craig Mackinlay MP has held a summit for small businesses in support of Small Business Saturday – an annual celebration of local business success. 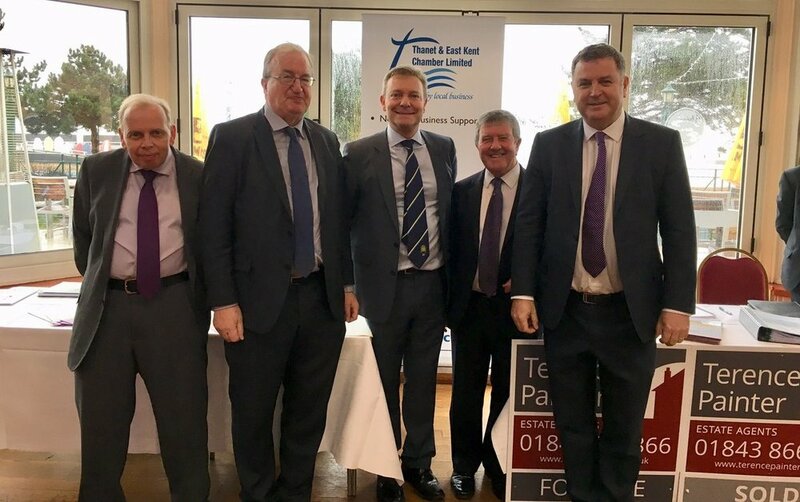 The event – which was sponsored by Kemps Chartered Accountants, Terence Painter Estate Agents and Thanet & East Kent Chamber Ltd - took place on Saturday, 1 December at The Pavilion on Harbour Street, Broadstairs. Craig co-hosted the event with the Financial Secretary to the Treasury and Paymaster General, The Rt Hon Mel Stride MP, who spoke to the tens of small business owners present. As the Minister with responsibility for corporate and small business taxation, and also HM Revenue & Customs and the Valuation Office Agency, Mr Stride briefed attendees on the Government’s tax policies with a focus on Business Rate reductions before taking business and tax-related questions from the floor. “From high-tech manufacturing firms to bakers, retailers, restaurants and social enterprises, Thanet is home to a record number 3,110 small businesses that are vital to our local economy, employing thousands of people. “Small businesses are the backbone of our economy, responsible for nearly half of economic output and 60 per cent of private sector employment, employing 16 million people in the UK. “They deserve our respect all year round. “That’s why it was great to welcome the Financial Secretary, The Rt Hon Mel Stride MP, to Broadstairs Pavilion on Small Business Saturday for a discussion and open Q&A with local businessmen and women. “Thank you to Kemps Chartered Accountants, Terence Painter Estate Agents and the Thanet & East Kent Chamber Ltd for sponsoring the event and for ensuring a productive day was had by all. “It was a pleasure to meet businesses operating across the spectrum from Craig’s constituency and to hear of the great optimism for their local economy.